Miss Dream » Blog » Picture Books Are A Coming! Picture Books Are A Coming! 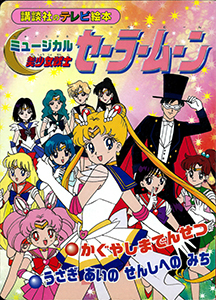 This week we bring you two of the many picture books of Sailor Moon that we got from Japan. The first shows the introduction of Sailor Mercury, from the anime, and the other is a short adaptation of two Sera Myus! There’s plenty more of them and A LOT more of other Sailor Moon goodies in the coming weeks! Stay tuned!